Apple takes the top spot among technology brands among American women, followed by Sony, Microsoft, Dell and HP. As part of our Women & Digital Life study we asked: “which technology brand or company do you admire the most?” on an open-ended basis. Twenty percent mentioned Apple, 14% mentioned Sony, Microsoft was #3 with just over 10%, followed by Dell at 10% and HP at 6%. Women are an increasingly important market for technology brands – in fact, an estimated 45 million women in the U.S. bought a digital product in the last six months. Other brands mentioned in the top 20 included Verizon, Google, LG, Nintendo, Samsung, Gateway, AT&T, Panasonic, GE, IBM, BlackBerry and Comcast. Apple’s dominance was pronounced among young women 12-24 (2-to-1 over Sony), while Sony and Apple were head-to-head to head among women 25-39. Among women 40+, Apple and Microsoft were head-to-head for the top spot. Sony took the top spot among African-American women while Apple was the top ‘top-of-mind’ tech brand by a small margin among Hispanic American women. Research found that Sony PlayStation franchise is very strong among African-American women and contributed to the win over Apple. One-in-three (~45 million U.S. women) bought a digital lifestyle product in the last six months. Among moms, 44% did and among women 25-39, 42% bought a digital product. Walmart and Best Buy are the top two destinations for purchases accounting for over 60% of women’s purchases. Target and Apple store are among the top five retailers for women. Women mentioning Apple as their top pick mentioned company’s record of innovation, ease of use of its products and particularly the iPod. Sony was most-frequently associated with quality and reliability over a long period, as well as diversity of its product line-up. Sony has everything—DVD players, TVs, games, radio, etc. Many of those mentioning Microsoft talked about their personal like of Bill Gates and in particular his philanthropic activities. Many also talked about the longevity of the company. Technical Stuff: This is the second in a series of releases from the Women & Digital Life study which is based on over 2,000 in-depth interviews and explores how women navigate in the age of broadband, mobile and social media. This release contains information from the TV chapter of the study. Women & Digital Life is an independent syndicated study conducted by SRG (Solutions Research Group). The fieldwork for this study was completed in December 2008 among a representative sample of 2,000 online American women consumers 12+. The sample captures all major population segments, e.g., parents with preschool kids, tweens or teens, young women, and empty nesters. Sample design included an oversample of African-American and English-speaking Hispanic women. Where applicable, the results are compared to a similar study undertaken by SRG in 2007 among 1,508 women, plus focus groups conducted over a 2-year period. To maintain an unbiased perspective, Solutions Research Group funds its own syndicated research. 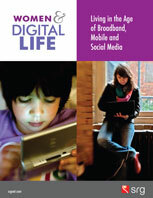 You can find out more on the reports here or keep up with Women & Digital Life on Twitter.